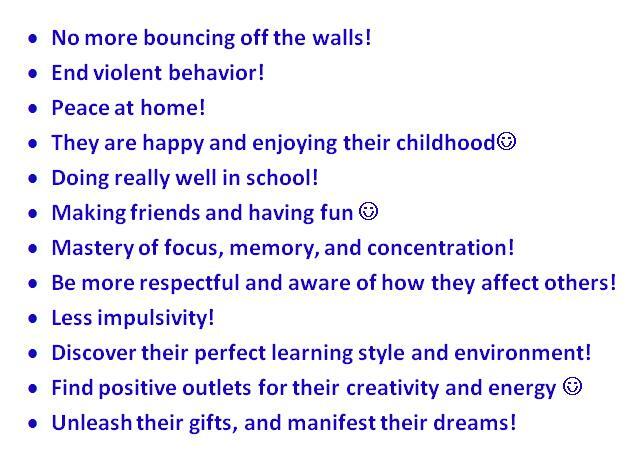 The results of the ADHD Mastery System for Parent's, Children, and Families in the Pittsburgh area are all of the bullets point above. I am going to through them one point by one, and explain how powerful this system is for your family! Helping children who have been labeled with ADHD is really all about helping them with their hypersensitive nervous system. There is so much going on for them that they find themselves so easily overwhelmed, and this leads to the anger, impulsiveness, emotions, etc. So, getting them grounded helps them to overcome all of this. e ways they can be stress relieving, the activities to ground them need to be body focused! What is so unique about the OVERCOME ADHD MASTERY SYSTEM is that it uses techniques that I developed and others that I learned that can be done anywhere and nearly at anytime. In fact, the techniques are so powerful that in time you won't even need to do them as they become part of who you are! See, this is not about managing symptoms, but truly unleashing MASTERY! To do this, it is so important that you as the parent get involved in what your child's interests are as these are the keys to their growth! This is how we unleash their potential! And truthfully, it is how we build their self esteem, and unlock their focus mastery. I am sure you may have noticed by now that what ever your child likes to do they seem to focus well at it. This is because it is their key to focus. What we do in the program is help them apply that to everything else, and the result of this are unprecedented! Grades go up instantly, and self confidence go through the roof! With your child's new found focus abilities and feel good attitude social stuff and respect follows suit! You can see how powerful this is. It all starts with building the foundation! As a parent, you see your child suffering with ADHD, and you just want it to stop! You want them to be able to succeed, do well, and be happy. 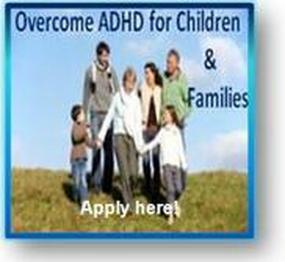 The Overcome ADHD Mastery Program for Children, Parents, and Families in Pittsburgh does just that!